Jeju World Cup Stadium got built to serve as one of the playing venues of the 2002 World Cup. It opened on 9 December 2001. 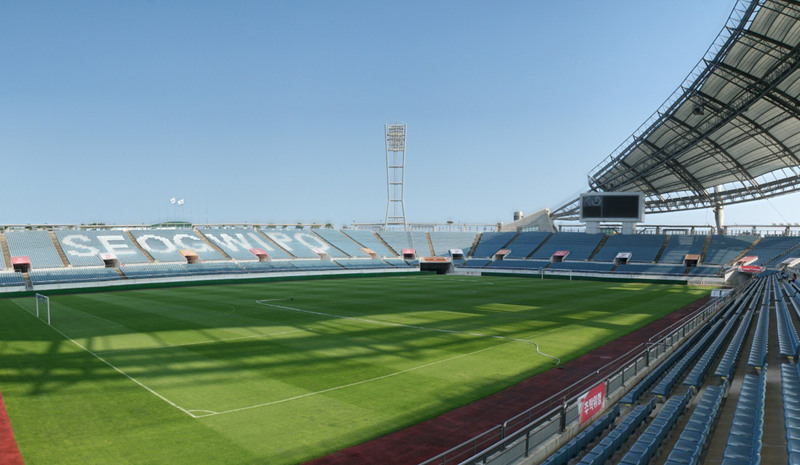 During the World Cup, Jeju World Cup Stadium hosted three games in the first round group stage. The stadium could initially hold 42,000 spectators, but this was reduced with 7,000 after the tournament following the removal of temporary seating. In 2013, following an extensive renovation, capacity was further reduced with another 6,000 seats. The design of Jeju World Cup Stadium was inspired by the volcanoes of Jeju Island with a roof resembling the sail of a local fishing boat. The stadium was built 14 metres into the ground to provide cover from the strong winds on the island of Jeju. Jeonju World Cup Stadium is located on the highway inbetween the city of Seogwipo and Jungmun Tourist Resort Complex on the island of Jeju off Korea’s southern coast. The distance from downtown Seogwipo in the east is about 6 kilometres and that from Jungmun in the west 10 kilometres. Jeju World Cup Stadium is located on the highway from Seogwipo to Jungmun with plenty of buses passing. There is a bus terminal, Seogwipo’s second largest, located right near the stadium as well. Jeju’s airport is located in the north of the island near Jeju City. There are frequent buses running between Jeju and Seogwipo as well as a direct “limousine” bus service (bus 600) from the airport to Seogwipo. Tickets for Jeju United games can be bought online through Interpark, or on the day of the match at the ticket office at the stadium (from two hours before the start of the match). Ticket prices can depend on the opponent but expect to pay KRW 20,000 to KRW 30,000 for a seat. Jeju-utd.com – Official website of Jeju United.